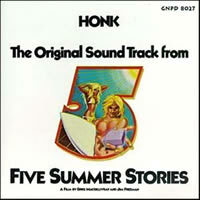 GNP Cresendo presents the original soundtrack to the 1972 feature film FIVE SUMMER STORIES.Well-crafted and wildly popular surf film made by Californians Greg MacGillivray and Jim Freeman. Although the MacGillivray-Freeman team had been making surf films together for over five years and were regarded as tops in the field, their previous movie, Waves of Change (1968), was a bit lost in the swirl of the early shortboard revolution and had been a box-office disappointment. It was agreed that Five Summer Stories would be their last surfing film, as both MacGillivray and Freeman were being courted by Hollywood studios. Artists include Steve Wood, Richard Stekol, Tris Imboden, Don Whaley, and others..